The 1893 Chicago World’s Columbian Exposition has been described as the third most important event in American History. The aim of the Exposition was to demonstrate to the world that America had become the most highly evolved culture in history, not only technologically superior but aesthetically mature. The Exposition was officially dedicated in 1892 to coincide with the 400th anniversary of Columbus' discovery of the "New World." Though only open for six months, the Exposition was so successful that it enjoyed a total attendance equal to nearly half the population of the United States. Click here to take a virtual tour of the World's Columbian Exposition, 1893. 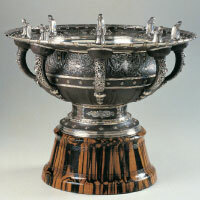 Among the Exposition's many exhibitors, Tiffany & Co. stands out for the quality and originality in design of the silver objects shown at the Exposition. The objects exhibited by Tiffany & Co. at the Exposition were highly prized by collectors then and remain so into the 21st Century. This exhibit will be the first time many of the important silver objects exhibited at the Columbian Exposition have been seen together since 1893, many of the pieces will be exhibited alongside their original design drawings. 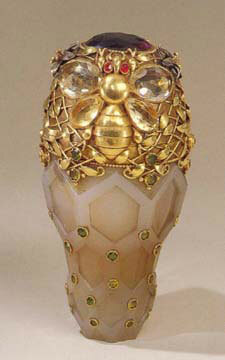 This exhibit will be open January 17th through April 16th of 2006 at the Flagler Museum in Palm Beach. A 156-page catalogue raisonné, written by Flagler Museum Director, John Blades, and Tiffany Design Director, John Loring, will be published in conjunction with this exhibition. The catalogue will include essays about the World’s Columbian Exposition, Whitehall’s connection to the Exposition and Tiffany & Co., and the Tiffany exhibit at the Exposition. In addition the catalogue will include, a facsimile print of a contemporary account of the Tiffany & Co. exhibit at the Exposition; a translation by John Loring of a contemporary account of the Tiffany & Co. exhibit written in French by the world’s authority on jewelry design at the time; a table listing all the objects made by Tiffany & Co. for the exposition, including a thumbnail image of each of the major objects, a description of each of the major objects, and the current owner or location of each object; and an index to the catalogue of names and terms. 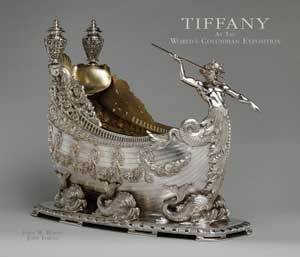 "The Tiffany exhibit at the World's Columbian Exposition in Chicago in 1893 was the greatest display of 19th-century American silver the world had ever seen, " said John Loring, design director at Tiffany and Company. "The current show at the Flagler Museum is the second greatest." "This luscious [exhibition catalogue] heightens our appreciation of the exposition and especially Tiffany's contribution to it." 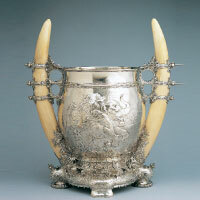 "Without question, it is the number one display of American gold and silversmithing ever seen. For anyone interested in American art, architecture, design, and the craftsmanship of precious objects, it is an absolute must see." "Tracing the whereabouts of the exquisite silver pieces, many of which hadn't been seen publicly or in this country in more than 100 years, was a fancy piece of detective work for sure. The exhibit provides a unique opportunity to view works of artistry and craftsmanship not likely to be duplicated, at least not any time soon." "An elegant reminder [of the World's Columbian Exposition] is at the Flagler Museum, where "Tiffany at the World's Columbian Exposition" displays some of the most beautiful objects made to support the American case. This is the first time the pieces Tiffany & Co.'s master silversmiths crafted for the fair have been shown together since the exposition." "The Flagler Museum has produced an impressive, very thorough catalog, with essays by John Loring, design director at Tiffany & Co. and Flagler Museum director John Blades. It complements an equally fine exhibition at the former home of Henry Morrison Flagler, who, it's nice to learn, was a satisfied Tiffany customer."